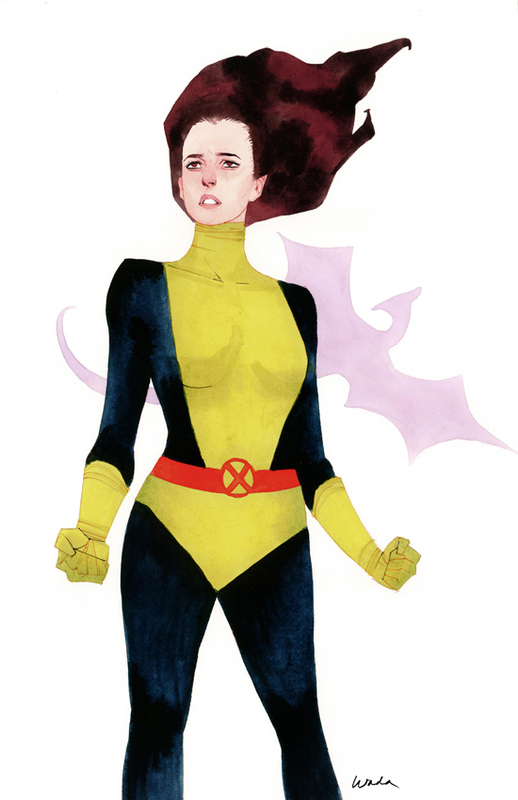 a kevin wada art blog: Kitty Pryde Series Part 2....aaand APE!!! Kitty Pryde Series Part 2....aaand APE!!! Here is Part 2 of the Kitty Pryde series, and for now, it will be the last installment. The client who commissioned these really wants to continue into the 90s costumes but for now my commission queue is a bit long. I think the classic costumed Kitty is my favorite. She is by far the most simple of the bunch, but I feel like her face is the best. The colors and shapes in that piece really please me and I'm happiest most with that one. The second costume is from when Kitty wanted to spice up her team outfit a bit more and decided to dress herself. Therefore, it's a crazy, zany, colorful mess. But it's kinda dope too. 1. If I set up a commission request system, would any of you be into it? It would have a fixed price and fixed size/guidelines. You can email me up to 1 week before the event and come pick them up at APE? Any takers? 2. What would YOU like to see me sell there? More postcards/$5 or less type stuff? More prints? More originals? A booklet? What do you enjoy seeing your artists sell? Needless to say I am beyond excited to do APE again! 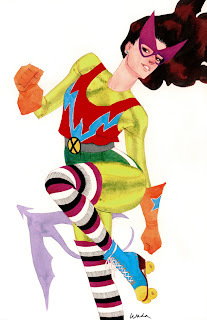 I simple love every drawing of X-Men you make.I also drew Kitty in that ugly uniform (lool) and it was ironically lovely. When I upload my drawings, I show you them, ok? I would be down for sure on the commission request, since I plan to attend again this year. So you can definitely count 2 sales from myself and my girlfriend, she loves your X-fashions, X-Vanity Fair pieces, and general style, after showing her a print I got from you last year. Prints and originals are something I am totally into. Not entirely sure about postcards, but again my friends pick up postcards to hang. My personal kick is a select few good prints (maybe from your store), maybe a limited expo exclusive (to be sold later on your store.) and any reasonably priced originals. Looking forward to seeing you at APE.